The New York Bank Hoard. 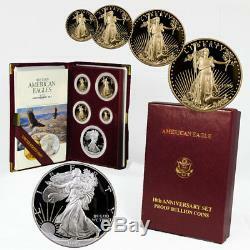 Mint 10th Anniversary Gold and Silver Eagle Proof Set SKU1342. Mint American Eagle 10th Anniversary Set? 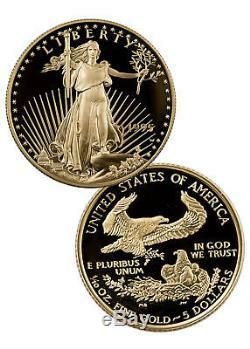 This gorgeous 5-coin proof set was issued by the United States Mint in celebration of the 10th Anniversary of the American Eagle Bullion Program. The set includes all four denominations of the American Gold Eagle, 1 oz. 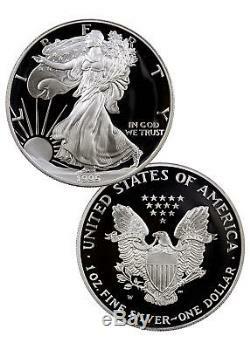 9167 fine gold, along with the American Silver Eagle struck from 1 Troy oz. 30,125 sets were minted, each coin struck at the West Point Mint bearing the "W" Mint mark, resulting in a key date for the Silver Eagle as the lowest recorded mintage of the series! United States Coinage Classics featuring Lady Liberty. The four Gold Eagles depict the Augustus Saint-Gaudens' 1907 Gold Double Eagle design on the obverse, with the dramatic bald eagle and nesting family scene created by Miley Busiek on the reverse. The Silver Eagle features the iconic 1916 Walking Liberty Half Dollar imagery by Adolph A. Weinman, with John Mercanti's heraldic eagle on the reverse. Breathtaking 5-Coin Proof Set in Original Government Packaging. Each coin in this 1995-W United States Mint American Eagle 10th Anniversary Proof Set is individually encapsulated, then beautifully presented together in a handsome fold open Mint-branded portfolio with presentation box. The set is accompanied by a U. Don't miss your opportunity to add this 1995-W American Eagle 10th Anniversary Set with the key date 1995-W Silver Eagle to your collection! Place the gorgeous set to your cart now! Specifications for this 1995 W U. We cannot make any price adjustments after the sale is complete. Product Photo Policy: MCM attempts to display product images shown on the site as accurately as possible. We take all of our photos in house and due to reflections on the mirrored or proof surfaces of a coin there may appear to be'black' when there is not. If a coin has a color on it at all it will be described as'colorized' in the description or title. Due to the large inventory we sell, we use stock photos. These charges are the customer's responsibility. However, we cannot guarantee this due to the volume of orders we process each day. Beyond the 30-day return period, Company is under no obligation to accept return of any product, but may in its discretion do so pursuant to this policy, for up to one year from the invoice date. ModernCoinMart (MCM) was launched in 2004 and quickly set the standards for online sales of bullion, US coins and world coins. Join over 100,000 loyal customers and feel confident purchasing from a company that's spent a decade building a solid and stellar reputation trusted and recognized around the world. That's the MCM way. This listing is currently undergoing maintenance, we apologise for any inconvenience caused. The item "1995 W U. Mint 10th Anniversary Gold and Silver Eagle Proof Set SKU1342" is in sale since Friday, December 21, 2018. Total Precious Metal Content: 1.85 oz.